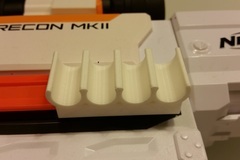 Avoid running out of darts with a small nerf holder. The holder is little tight to the gun but rather having it like this than having it fall off in the middle of the game. And the expected wear and tear might loosen it a bit.